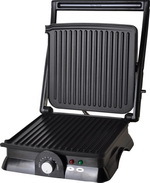 Panini makers are another kitchen tool for those who have a love affair with grilling, this time grilled sandwiches. Grilling sandwiches is an export from Italy, allegedly Panini means sandwich in Italian. Of course you can make a Panini without one of these sandwich machines by placing a heavy object such as a grill press on top of your sandwich in a grill pan on the stove to get the grill marks on one side, then flip your sandwich over gently to get your grill marks on the other side of the sandwich or you can just go with a machine that is designed to make these types of sandwiches without any flipping of the sandwich so the difference in how you grill your sandwich is one step or two, and the machine has other uses that may for some justify the price of a machine as opposed to using a grill press. Since these machines are electric they have temperature controls that allow you to determine how you want your sandwich to cook. These portable machines come in small grills for making one sandwich or grills with at least two grill plates for making two sandwiches at a time. These machines have the same basic design, two grill plates one on top and one on the bottom with a hinged handle on the top grill plate that allows you to open and close the top plate over the bottom plate with a sandwich in between and after a short time presto a hot sandwich with grill marks. Another nice feature of panini makers is that the grill plates are generally nonstick for easy removal of the cooked sandwich and easy cleanup, which should be done while the grill is still warm after turning it off and using something that will not remove the nonstick finish on the grill plates such as a plastic scrapper to get between the grill ridges to remove any stuck pieces of sandwich or other cooked food. Then the grill plates can be wiped clean with a wet cloth and warm water, then it should be thoroughly dried and it is really for the next use. If there is stubborn food stuck in the ridges, then a wet towel can be placed on the grill and the top press lowered for a few minutes of soaking, the grill will have to be turned on, heated for a few minutes and then turned off again before placing the wet towel on the grill, you don’t want it to be plugged in while cleaning in this way. In addition to grilling sandwiches you can also use panini makers to grill vegetables, like making kabobs but without inserting the vegetables on a skewer.